The first choice of foreign English teachers for many Chinese might still be native speakers from countries like the US, UK and Australia. However, Filipino teachers are becoming increasingly popular among cost-conscious Chinese language learners. With a computer and a big smile, Mike Alfi starts his work as early as 6 am. The 27-year-old from Bacolod city in the Philippines is a home-based English language teacher who has been teaching online Chinese students thousands of miles away for three years. Filipino English teachers started gaining popularity in China after several Chinese online teaching platforms opened branches or teaching bases in the Philippines. These include 51Talk and First Future. These internet platforms mainly target kindergarteners to 12th graders (K-12). The busy hours for Filipino online teachers start when Chinese students return from school. Sometimes they prefer online tuitions even before school hours. "I usually work 6 to 7 hours a day. I get up at 5 am and start work at 6. The busiest time is 6 pm when students come back home. During weekends, I'm always busy for a whole day," said Alfi. Like Alfi, there are more than 10,000 Filipinos working for internet-based teaching sites and the demand is growing fast. "Online education is a hundred-billion-yuan market. 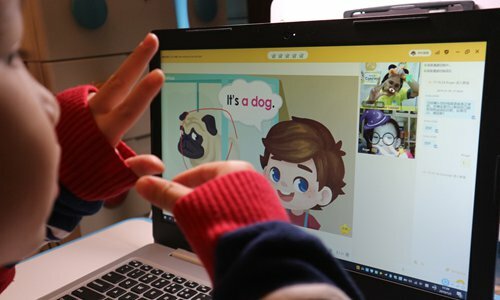 Chinese parents especially those from first- and second-tier cities have demanding requirements for their children's education and many of them resort to online education resources. English and mathematical logic are most popular classes,"Wu Jing, CEO of online teaching company Koudai Kids told the Global Times. According to 51Talk, there will be a shortage of 500,000 foreign English teachers in China. The company said it has 10 million registered students and plans to increase the number of Filipino teachers from 16,000 to 100,000 in the next five years. When one searches for "Filipino English teachers" on Baidu, a Chinese searching engine, "Filipino English teachers' accent" appears in the related search section. "Filipinos are not native English speakers. Many Chinese parents are not good at English so they can't tell whether Filipino teachers pronounce well. Western teachers are no doubt more reliable," said the mother of a 10 year-old boy surnamed Xiong. To dispel doubts, these Chinese online teaching platforms emphasize that they hire foreign teachers who have a good accent, are fluent in English and have good educational backgrounds. Some companies even claim only 3 percent of foreign teachers can pass their entrance examination. English is the Philippines' official language. Some Filipinos do have a clear American accent partly because the country was a US colony for five decades. But many others have a local accent mixed in that lends a twist to the diction. Well-educated Filipinos are relatively fluent speakers and have better pronunciation. For an increasing number of Chinese who want to improve English, the benefits of studying with Filipino English teachers are obvious. The price of a 25-minute online course provided by an American teacher is more than 120 yuan ($17.6), while that of a Filipino teacher costs only 40 yuan. It is also easier for Chinese companies to control costs in the Philippines. "The cost of teachers and technical maintenance in the Philippines is much lower. Managing the team is also more convenient because the country is in the same time zone as China," said Wu. Creating jobs is one of the top priorities for Philippine President Rodrigo Duterte. The expansion of Chinese online teaching platforms in the Philippines is undoubtedly in line with his agenda. Duterte personally started a "promotion" for Filipino English teachers in China last year. He said before attending the Boao Forum for Asia in 2018 that at least 100,000 Filipino English teachers are needed in China. It was since then that the governments of the two countries started talks on hiring them. Philippine Ambassador to China Chito Sta Romana recently told the Global Times that the two governments had signed an agreement under which about 2,000 Chinese universities will start hiring about 2,000 Filipino English teachers. For 51Talk COO Zhang Liming, it's good news for online English education companies. "That shows the Chinese government's recognition of Filipino English teachers which will convince more Chinese people that Filipinos can be good English teachers," said Huang. It could be an opportunity for online teachers too. Online English teaching is considered a relatively high-income job in the Philippines. People familiar with the industry told the Global Times that online teachers' salary varies according to the length of work time, experience and their popularity. On average, they earn more than 3,000 yuan per month. The most popular teacher gets as much as 10,000 yuan per month. The entry-level pay for public school teachers in the Philippines is 21,000 pesos ($400), according to Philippine Star. Many believe Filipino English teachers could receive higher salaries if they are hired in China. Secretary of the Philippines' Department of Labor Silvestre Bello III once predicted that they could be paid up to 60,000 pesos ($1,150) a month. Alfi hopes he could teach English in China some day. "I'm learning Chinese now. I would love to work in China. If there is an opportunity, why not?"